Flamboyant cuttlefish. The name of the thing just sounds to me like something I’ve just got to see. 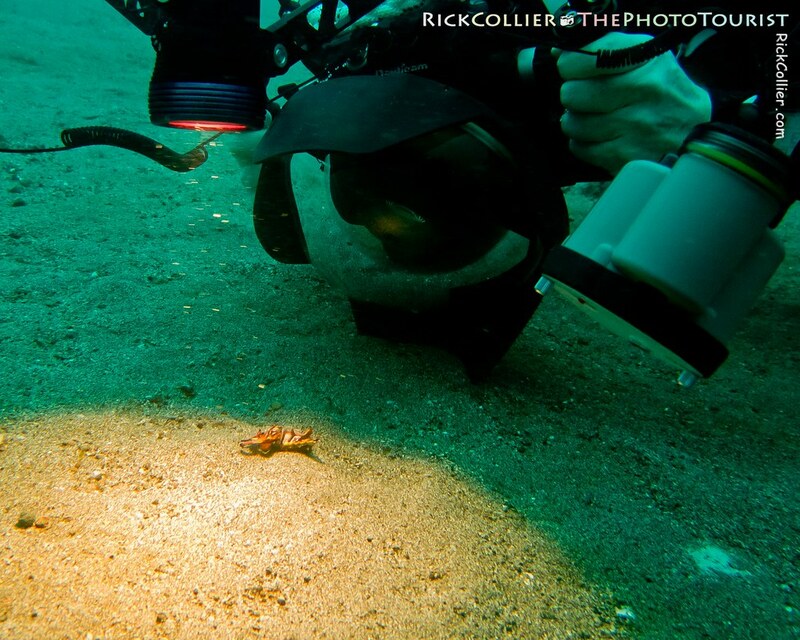 We’ve all seen cuttlefish (or perhaps pictures): They’re common in all oceans. The critter is all head, with little tentacles. They are the original source of that thing we hang up in bird cages for our pets to gnaw — the cuttlebone (also useful as a calcium supplement for hermit crabs, snails, reptiles, etc.). They generally come in gray, brown, tan … some inoffensive beige-ish color. But how does a cuttlefish get to be flamboyant? Having read about them (even seen a few pictures, which I only half-remembered), I really wanted to see a flamboyant cuttlefish. It was on my short list when the dive shop staff at The Lembeh Resort asked what we wanted to see. 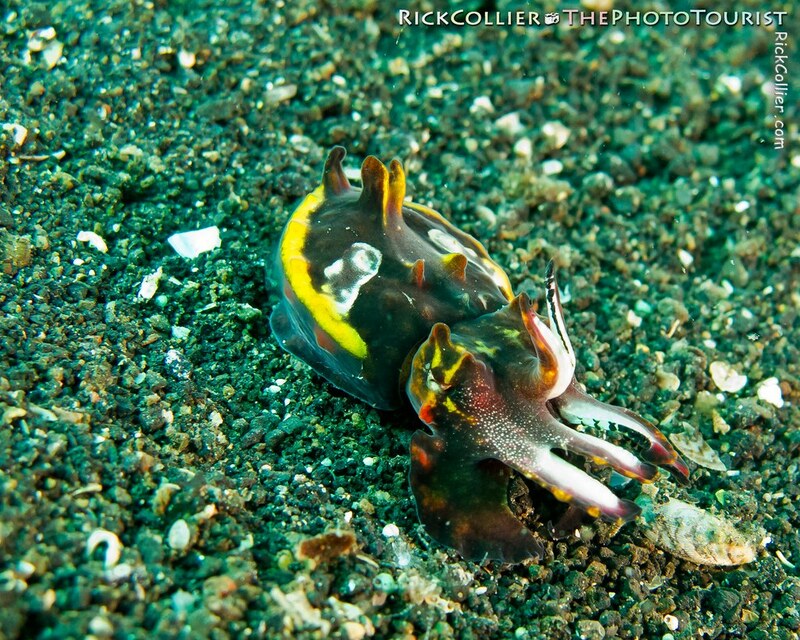 We came across a number of flamboyant cuttlefish in the sand along the bottom of the Lembeh Strait. The flamboyant cuttlefish (“Pfeffer’s Flamboyant Cuttlefish,” Metasepia pfefferi) is named the bright warning coloration it adopts when approached. Normally it is very drab — dull shades of brown, looking like a rock on the sandy bottom, “walking” sedately around the bottom using its lower arms (tentacles). It adopts bright shades of red, purple, and pink with that distinctive yellow border when disturbed (for instance, by a hulking diver shoving a large camera lens into its “face”). Like almost everything we saw in the Strait, this is a very small beastie; the ones we saw were between two and four inches (say, about 5 to 10 cm) long, including tentacles. The first time we saw one, I assumed it must’ve been a baby. Wrong. We spied many on our dives. They were all tiny. On the last dive we were surprised to find one nearly four or five inches (10-12 cm) long. That one was worthy of conversation back on the dive boat: A giant! This entry was posted on Wednesday, March 2nd, 2011 at 13:55 PM. It is filed under thePhotoTourist, Underwater and tagged with bottom, critter, cuttlefish, diver, diving, flamboyant, flamboyant cuttlefish, Indonesia, Lembeh, Lembeh Strait, metasepia, Metasepia pfefferi, North Sulawesi, ocean, Pfeffer's flamboyant cuttlefish, photographer, sand, scuba, scuba diver, sea, Sulawesi, The Lembeh Resort, Underwater, underwater photographer. You can follow any responses to this entry through the RSS 2.0 feed.